If you're looking for ways to improve your podcast, skip these. They may improve your podcasting workflow, but they won't make your podcast better. Thanks to Darla from Scientific Quilter for inspiring and suggesting this topic! UPDATE: there's a great conversation about these points in the Podcasting Technology and Resource group on LinkedIn. Despite the name, enhanced podcasts really aren't that great. These are specially formatted audio files the support changing cover art, chapter markings, and embedded links. This sounds great, but it really doesn't provide a reasonable enhancement to the listening experience. Audio podcasts are consumable while driving, working, shopping, exercising, and more. The benefits of an enhanced podcast are lost in these environments. Also don't assume that just because someone uses iTunes, they want or can even use an enhanced podcast. The production time and software requirements significantly increase with enhanced podcasts, but the payback is very little. If you absolutely must show something, point your listeners to your well-written shownotes or start a video podcast. Audacity is completely free, but it may cost a little extra time to do what you want. You could spend up to $350 to upgrade your audio-editing software, but it won't improve the quality of your podcast; software only makes things easier (or sometimes just different) for you. I have thousands of dollars of podcasting equipment and a licensed copy of Adobe Audition (with my Creative Cloud membership), but I still use Audacity. Twitter is still such a social-media rage, but the number of followers you have makes almost no difference to your podcast, or even increasing the size of your audience. If you want to use Twitter to enhance your podcast, you have to be proactive and reach out. Simply having more followers makes no difference. Similar to upgrading your software, upgrading your computer (or switching to a Mac) will not improve your podcast. You may like how you can do things on a different PC, but your audio or video files will probably be the same. Does an expert photographer take better pictures with a newer camera? No. Because art does not depend on the tools, it depends on the technique. Extra money from your podcast can be nice, especially if you've worked your guts out to build a big enough podcast audience or empire that a sponsorship can be your new primary income. But simply being doesn't give you new content, bring more listeners, or improve your audience quality. But a case can be made that sponsorship diminishes a podcast with interruptions, website banner ads, long commercials, and such. 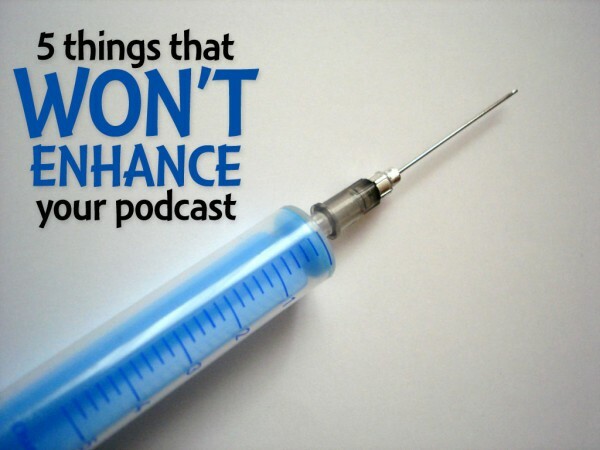 Have you discovered things that do enhance your podcast? Or maybe things you tried but didn't? I would love to hear your feedback in the comments! Don't click that link if you receive this Twitter DM. Instead, you or the person who sent it to you needs to know how to fix a hacked Twitter account from my personal blog at DanielJLewis.net. I use Shortcode Exec PHP, which allows me to assign HTML and even PHP code to a WordPress shortcode. This makes it easier to repeat the things that never change between episodes. This also protects against some nasty “cleaning” that WordPress will often do. Like if you write a post and insert a script tag in the HTML editor, save it, switch editing views, and the script tag will be gone. Or sometimes classes are removed from objects. These kinds of things completely break site functionality if you don’t watch for it. Like my Twitter follow and Facebook like buttons within the post will break to regular text links if WordPress “cleans” the code. Using shortcodes allows me to bypass this concern. A “newer” computer may or may not enhance your podcast, but better equipment definitely will. A computer with a better sound card actually might improve things. An $80 USB mixer and a $50 mic will drastically improve a cast. Yes! I should have clarified that point better. I’ve heard many podcasters think that simply having a newer computer will make things better. But even an old computer that generates noise through the input can be improved with other minor upgrades, like a USB audio adapter. But putting that money into a better mixer or mics will make a much bigger improvement to the listeners. Buy a Mac and you get Garageband for free – and that’s a much better audio editing suite than Audacity. Better tools DO make for better product, if you can be bothered to learn to use them. Actually, I think Garageband does a lot of things that are unnecessary or a strange way—very different from most audio-editors. But if this makes it easier for the podcaster, that’s fantastic. Use the tool that works best for you. But using Garageband or Audacity does nothing to actually enhance a podcast to its listeners. A better tool enhances your workflow. This can trickle down to a better podcast (like quicker publishing, more time for preparations), but a better audio-editor does not directly enhance a podcast to its listeners. A good tool enhances the experience for the listener by making the podcast sound better. A badly edited podcast can be hard work to listen to – and people won’t listen at all if they find it hard work. If your podcast is simply talk it’s not a a big issue but if you’re mixing music, talk, sound effects, jingles and other audio then having something that does so easily and flexibly is what you need. Garageband is basically a stripped down version of Logic Pro, which is a professional product used by many studios. Again, this comes down to the knowledge of the program, not the ability of the program itself. Yes, GarageBand can do things that Audacity can’t, and vice versa. The better tool is the one that you can use with more knowledge. I find that a prep sheet make it easier to have a good/better show. In my show I have a co-host, and having the show notes set up in advance makes it easier to record and cover topics, instead of just doing a “skin of your teeth” show. Failure to plan is a plan to fail. I like just having bullet points to toss out and try to hit. This make it very easy to just plow on if one topic is very short or boring to me or my co-host and does not spark a conversation. It also keeps us from having to guess where the other person is going. However I do like that I have “forced” my self to put out a podcast every week so that I have a bit of pressure to do something, as other wise I might just put it off and not get it done at all. Thanks for the Inspiration and direction. I now prewrite all of my shownotes. For our Once Upon a Time podcast, it’s quite a bit harder because four of us have our own separate notes and perspectives. So I just lead the conversation off my notes, and then combine our thoughts in the published shownotes. Writing your shownotes first also helps publishing an episode faster because you can repurpose those notes for your blog post. I’ve played around with Audacity, but I’m really enjoying Reaper. It may not improve sound quality directly (although judicious use of good plugins can really help), but the speed and ease of editing can be a real benefit. (Ripple editing, to pick just one example, is brilliant.) And at $60 for most use cases plus a very generous demo policy, it’s an amazing value. Those are exactly the reasons to use premium software. I use Adobe Audition because it simplifies, enhances, and speeds up my own workflow.